It is a widely known and accepted fact that supplementation is a large portion of cash costs for every cattle operation. Protein is a crucial nutrient in a beef cattle diet (or any species for that matter). Unfortunately, protein supplementation is frequently a high-cost item in the nutritional program, and therefore, often ignored. Protein is essential within the diet of a ruminant to supply the ammonia needed for microbial growth and provide the amino acids needed for absorption from the small intestine. A deficiency in protein can limit microbial activity, microbial protein synthesis and rate of digestion. All of these can impact feed and energy intake. Furthermore, if an animal receives insufficient amounts of protein, production of meat, milk and wool can be dramatically reduced. However, when a producer is supplying supplemental protein to their livestock, they don’t always think about how much of that protein the animal is actually utilizing. Regardless of the nutrient, there is a portion that can and can’t be utilized by the animal. The component that is available to be utilized by the animal is considered “digestible”. On average, only about 40% of supplemental protein can actually be digested by the animal and used for growth, reproduction, lactation, etc. So how can we make digestibility of protein more efficient? By increasing production of microbial cell protein (MCP). Microbial cell protein is the purest form of protein (up to 80% digestible) and is derived from bacteria present in the digestive system. Amaferm®, found in EVERY BioZyme product, has been shown to result in an average increase in MCP of 34%, which correlates to more performance and ultimately more profit in your pocket. In addition to the use of Amaferm, here are a few extra tips to proper, economical protein supplementation. 1. Identify your animal’s requirements. In order to develop a cost effective supplementation program, you must first know the protein and energy requirements of your animals. Requirements for protein vary throughout the year and are dependent on the animal’s stage of production. For example, growing calves and cows in early lactation have some of the highest protein requirements. From weaning to puberty, cattle experience the largest increase in protein deposition throughout their lifetime. In turn, their requirement for dietary protein is particularly high as well. In regards to a cow that has just calved, her requirements are highest the first two months post calving due to the increase in protein demanded for lactation; while her lowest requirements are seen post-weaning. A cow’s protein requirement will begin to gradually increase again as fetal development increases. 2. Identify what is in your feed. The second step in creating a successful supplementation program is knowing the protein content of your total diet. Protein can come from pasture, stored forages and supplemental feeds such as grain. BioZyme provides lab testing and ration balancing services free of charge to its customers. By understanding the nutrient profile of your available feedstuffs, you can better identify what supplements you can add to your feeding program to meet nutrient requirements and optimize animal performance without over or under feeding. 3. Identify which product best fits your management situation. Generally, protein supplementation is needed in the late summer when forage quality is at its lowest and when grazing crop residues in late winter. For fall calving herds, forage protein is usually limited during early lactation. 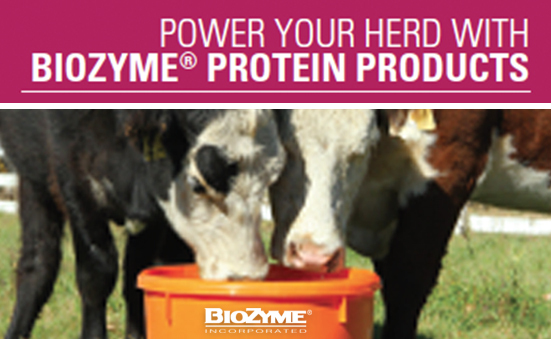 BioZyme offers a variety of high-quality protein supplements to meet a producer’s supplemental protein needs. The Concept•Aid® POWER Products all contain 20%, all-natural CP and provide enough vitamins and minerals to serve as a replacement for loose mineral supplements. VitaFerm® offers its POWER protein supplements in tub, meal and block form to fit differing management scenarios, allowing for maximum convenience along with improved animal performance. As a more economical alternative, the VitaFerm 30-13% Protein Tub offers a higher protein level in a smaller feeding rate, as well as a complete mineral package in every feeding. Proper protein supplementation at various stages of production can prove extremely beneficial to overall animal productivity. The Amaferm advantage present in VitaFerm products increases the rate of digestion, allowing animals to meet their nutrient requirements faster and on less feed. Increased forage digestion provides for greater microbial growth and production of microbial protein to provide the animal with more protein for growth, lactation and reproduction.